Last Saturday we went on a field trip with our Photographics class to Crystal Cove. We got there early, around 8:30 am. As per usual the sky along the coast was overcast. Even though it’s nice to have “open shade” type lighting for outdoor photos the gray clouds made many of our images look dull. Despite this I loved photographing at the beach, the rock formations make for great shots. 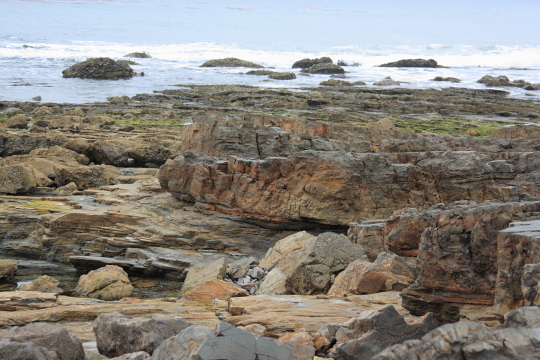 We also climbed between a few of these rocks and took a few photos of some tide pool creatures including a baby seal. The photo from this week was shot by Bryan and it shows the beautiful rock formations that make this particular beach so photogenic. For more photos from our field trip check out our GALLERY. Photo Info: Taken with the Rebel XTi at ISO 100, F4 at 1/160 of a second.